Do you and your family love adrenaline-pumping adventures? Families searching for the experience of a lifetime can find excitement and thrills for themselves in the Smoky Mountains. In an area of trails, outdoor sports and unique attractions, Smoky Mountain Outdoors has become a leader in Gatlinburg white water rafting. To give visitors a one-of-a-kind trip, we offer not only rafting but a hike and paddle package to see the very best of the Smokies from land and water. Though there are many attraction in Gatlinburg to choose from, Smoky Mountain Outdoors combines a relaxing excursion with a wild and wet ride. 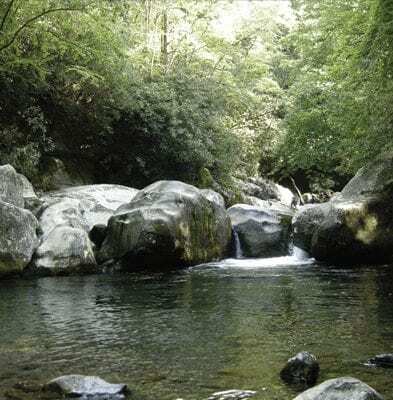 This package is a full day of activities, so we begin at 9:00am, where adventurers will begin a guided two hour hike into the Great Smoky Mountains National Park. The fun of this trip is that your guide will make sure to include the most beautiful nature spots and can point out historic spots you might miss along the journey. Traveling along a beautiful mountain stream, there are few spots more spectacular. After completing the hike, we provide a lunch of sandwiches, snacks and drinks beside the river to let everyone rest and relax before beginning the Gatlinburg white water rafting trip. At 2:00pm, you’ll begin the white water trip, so we ask that everyone is at the outpost one hour ahead to prepare to meet the guide and get outfitted in the safety gear. After finding a helmet and vest, your guide will begin by going through safety tips and tricks to have the best trip possible. After that, the adventure begins! The group, along with the experienced guide, will face Class 3 and 4 rapids, which are difficult but predictable with long rapids and a guarantee to get wet. At only $59.95 per person, the hike and paddle adventure is a great value for an all day family adventure. If the hike and paddle combination is more than you’re looking for, we also offer Gatlinburg white water rafting trips down the Upper Pigeon River and Lower Pigeon River without hiking. The Upper Pigeon River rafting trip is 6.5 miles long with 70 rapids that range from Class 1 to 4. This two hour trip begins with a safety talk and bus ride followed by the adventure of a lifetime, and, best of all, there’s no experience needed to take on the frothy waves. The Lower Pigeon River rafting trip is an easier trip with only 5.5 miles of travel and 50 Class 1 and 2 rapids. Kids and parents love this trip because there is plenty of time for splashing and water fights without fear of flipping the raft. No matter how extreme you want your adventure, we put safety first, so plan your own Hike and Paddle trip today by reserving online or calling us at (800) 771-7238. Gatlinburg white water rafting begins again in March, so be sure to reserve ahead to make sure your spot is open and ready. For your next adventure, we hope to see you in the Smokies!